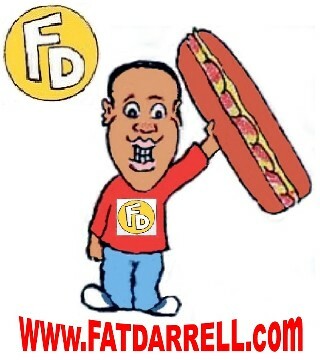 Married at First Bite – #DoubleFML FatDarrellPalooza! Welcome back everybody! So 2 weekends have now passed since the new Fast and the Furious movie came out and I still haven’t seen it yet. Apparently it’s breaking all types of records but unfortunately I have not contributed to those box office numbers yet. There really aren’t enough hours in the day sometimes. Hopefully I can catch it this week. I almost had time on Saturday, but I was starving by the time that my schedule cleared and I knew that if I went to the movies hungry, I would have ended up spending a small fortune! Seriously, nachos alone will set you back like $8 and the way that I eat, I would have definitely ordered much more than that! Besides, I don’t really like having full meals at the theater because it’s hard to fully get lost in the movie when I have to keep looking down at the plate. That’s why I would have to get something simple like popcorn or candy so that it wouldn’t matter if it spilled into my lap. Had I planned it better, I would have brought a protein bar or a protein cookie with me and snuck that in. That’s about as bold as I’ve personally gone with sneaking in food. Back in the day the movie ushers used to go around with flashlights like The Feds or something so even though those days are essentially over, I still feel way too guilty. Besides, overpriced snacks are a part of the experience. However I have bared witness to some pretty amazing smuggling acts! Sneaking in candy is rather basic so no props for that. Chips, cookies and popcorn are pretty common too although I did see a lady pull a full bag of microwave popcorn out of her jacket so that was different. But shoutout to the lady who I spotted eating sushi with soy sauce, wasabi and chopsticks! It was dark and she was a few rows in front of me but I’m pretty sure that she also had a pint of Miso soup and a salad as well. That was some all-star smuggling but as a woman, she could carry it in her purse. Therefore the all-time record goes to the guy who I saw pull out a huge box of Popeye’s chicken with a full bottle of hot sauce and what appeared to be a 2-liter bottle of soda from his jacket! Now THAT was impressive! Speaking of candy, this meme really brought me back. I hadn’t thought of that until now but wow, a dollar really did go a long way back in the day! Those quarter-waters were the truth man! Plus Bazooka Joe gum with the comics inside for only a nickel? What?! I forgot about all of that. Even those little apple pies and the cupcakes with the cream filling were only like 50 cents. A dollar could get you a sugary feast back then and the amount you could have bought with a $5 bill might have just been enough to give you diabetes. Ah good times lol I feel like an old man right now though haha “Back in my day kids…” but yeah, now that 90’s music is officially on the oldies station, I guess I can say that and actually mean it! Another thing that I missed out on was this limited time Unicorn Frappuccino that Starbucks rolled out last week. As I’ve stated in several posts, I’m not a huge coffee drinker but I may have to see what the hype is all about. I hear that most locations ran out of them though so I may not find it anyway. In fact, finding a Starbucks location that still has Unicorn Frappuccino ingredients might be harder than finding an actual unicorn at this point but we shall see eh? Have you tried it? Tell us what you think in the comments below! So yes, I missed out of The Fate of the Furious movie and yes, I missed out on the Unicorn Frap but I absolutely did NOT miss out on $4.20 burritos and bowls for 4/20 at this local Mexican restaurant. “Which did I get, a burrito or a bowl” you ask? Ha, clearly you haven’t been paying attention, I got one of each! The staff knew they were in for it as soon as I kicked the door open like a cowboy in an old western movie. The girl at the guacamole station cracked her knuckles as I approached the counter because she knew I was about to put them to work lol. This guy doesn’t mess around when it comes to burritos…or tacos….or fajitas…or enchiladas… although they’re all essentially the same thing: delicious. I don’t even smoke, but I can definitely get behind any day that scores me discounted burritos so you already know that I’m looking forward to Cinco de Mayo – Arriba! Another thing that I didn’t miss was the premier of the new season of Married at First Sight. Have you seen this show? Basically, these experts match 3 couples for a legally binding marriage. They literally don’t meet or speak to each other for the first time until they’re at the altar! They’re documented as they try to develop into a true couple over an 8-week period. At the end of the 2 months, they have the option to either get a divorce or stay together. Crazy right?! I stumbled upon the show while dial-flipping but it’s such a crazy social experiment that it’s hard to stop watching once you start! I would never be able to let somebody pick a wife for me though, wow, just the thought of that is scary! I mean, if you want to order my lunch for me? Sure, I’m greedy enough to eat anything. Pick out my outfit? Depending on where I was going, sure why not? Set me up on a blind date? Maybe, but even then I’d have some intel going into the situation and could end it if things weren’t going well. An arranged marriage though? Oh no lol that’s way too much responsibility to let someone else have control over. So far these experts seem to be doing a pretty good job though because the couples look decent together. I remember watching some awkward exchanges on past seasons that I’ve managed to catch but practice makes perfect I suppose. So far they seem like they’re off to a great start…but again, that was only episode one. Even if I was crazy enough to marry a stranger though, I wouldn’t want my life taped for 8 weeks as I tried to get to know my wife. Man talk about added stress on the relationship! Could you ever do that? And more importantly, why would you do that? Tell us about it in the comments below. Speaking of arranged marriages and Mexican food (hold on, I’m going somewhere with this lol bare with me…), if you follow the Fat Darrell page on Facebook (click the social media buttons to follow me now), you may have seen that photo I posted a few weeks ago with the pizza covered in tacos. Mmmm, yes #foodporn indeed but I had no idea that it actually existed. I thought that it was just some internet fantasy or another unicorn per se, but nope, it’s real! My friend Don tagged me in a photo from the New Jersey based restaurant, Tony Boloney’s, who is responsible for this monstrosity. It’s 30 lbs of pizza with 2 dozen meat stuffed tacos, guacamole, sour cream and cheese! O-M-G I need this in my life! Coincidentally, I’ll be in New Jersey this Thursday for a banquet so if I can convince my brother to make a side trip through Atlantic City, I may be able to get a slice…or 2…or 3… we’ll only be up there for about 24 hours though so my guacamole dreams may have to wait until the next trip. But if nothing else, I’m not leaving The Garden State without at least getting some type of pizza (it’s just not the same down here in Atlanta) and a pork roll egg and cheese (if you don’t know what that is, read this post) before we leave town! Of course, the Taco Pizza, as amazing as it sounds still feels more like an awkward arranged marriage than a true harmonious union because I don’t see how’d you’d be able to truly eat the pizza and tacos together in one bite. It would appear as though you’d have to take the taco off to eat it separately, but I could be wrong. I’m also wondering if the sauce is more like taco sauce than pizza sauce to blend the flavors? I’m sure it’s still incredible either way though so if I’m driving and my brother falls asleep in the car, he just might wake up in Atlantic City as I’m placing my order!. My friend Rebekah had an idea to make a pizza that has a crust made from spring rolls. When she first mentioned it, I didn’t think that it would work because the thought of cheese with spring rolls made my stomach turn. And don’t get me wrong, that thought still sounds gross but what if instead of cheese it was an extra-large mandarin pancake with plum sauce topped with Moo Shu stir fry and other goodies? Hmm…I’ll have to brainstorm this more but I think she may be onto something. Cooking really is like matchmaking though. When I decided to blend the ingredients of chicken fingers, mozzarella sticks, French fries and marinara sauce to create The ®Fat Darrell Sandwich, I was essentially playing matchmaker between those items and hoping it would work out too. Granted, it’s a lot easier to do with food than it is with people (and arguably less messy), but still just as fun when a new pairing works out. With that said, here are a few popular food combinations who were also married at first sight…or should I say married at first bite? These couples are definitely into each other, but still aren’t quite ready to be exclusively committed forever. In fact, you didn’t hear this from me, but I’m pretty sure that I saw Steak and Shrimp together just the other night…. I know, scandalous right?! Did you notice these saltine flip-flops last post? Check out the “It Happens” and “Burger Time” Posts for more! These non-traditional couples blend 3 or more participants…oh my, Big Love eh? What other food couples can you think of? Which category would they fall under? Tell us in the comments below! Another event that happened this past week was Earth Day which serves as a great reminder to slow down sometimes and just enjoy nature more. I have so many goals I want to accomplish that I often lose sight of the little things since I’m always in too much of a hurry to appreciate them. Just the other day, my father asked me if the beautiful ivy was still growing on the wall behind my apartment and I had no idea what he was talking about. Bare in mind, my father has only been to my apartment about 5 times while I’ve lived here nearly 5 years yet he could tell you more about the trees and plants outside than I can! The fact that I’m looking forward to the 2-hour flight I’ll be taking in a few days because it’ll force me to do nothing for a few hours (sort of… I’ll still have my phone and laptop though) is another sad indictment on how thin I’ve spread myself lately. I’m sure that many of you reading this are in the same boat. So today’s fitness tip is just a reminder to slow down every now and then. Schedule breaks for yourself just as you’d schedule the rest of your week. Also plan a vacation or if nothing else, just take 15 minutes to turn everything off and be present for awhile. I’m as type-A as they come so I understand how difficult that may be but it really is necessary which is why I’m trying to do that more now as well. You miss a lot when you’re always focused on the next thing and don’t take the time to appreciate what’s right in front of you. So I encourage you all to get off the proverbial treadmill every now and then, recharge your batteries and get outside to stare at the ivy for a little while. Have a fitness question or accomplishment you’d like to share? Tell us about it in the comments section below! Have another song that fits today’s themes or that we should just check out anyway? Tell us about it in the comments section below! So yes, as mentioned, I’ll be heading up to New Jersey later this week and also spending time with my brother and his family in Virginia. That means that I’ll also get to see this little monster. If you’re a regular reader, you’ll recognize that yes, that is my 5-year-old nephew Domonick. I’d better rest up, I’m sure he’s going to have me running all over the house. Hopefully I won’t step on any Legos while I’m barefoot this time. If you’ve never done that before trust me, it’s the worst! A reader sent me a photo of this shirt to order for him. That’s actually not a bad idea – he’s got excellent taste in women from what I can tell so far. I’d definitely trust him more than most adults I know! But easy on the “new aunt” part, whoa, baby steps eh? Anyway, that about does it for today. Again, please drop a comment below and continue to share this page. There’s much more to come but none of it gets done without your support so I genuinely appreciate you all. Let’s make it a great week people and May the Fork be With You! Previous Post The Grinch that Stole Easter, Kawehi and Another Round of Foodie Shoes! I see that you are heading to NJ, the state with Pork roll and cheese sandwiches and of course your famous “Fat Darrell” sandwich. Have one for me!!! As usual, I enjoyed reading your post today and salivating over all of the good food!!!!. Enjoy your trip! Yes, it’ll be such a quick trip to NJ though so we’ll see how many food stops that I can fit in! Ha thanks for your comment! “Married at First Bite” – what a smart theme for today, starting with you and your “Fat Darrell sandwich” Love those marriages!!!! I am trying to think of others,but right now, I am “drawing a blank.”” Keep your creative juices flowing, until next time!!!!! Yes, I’m drawing a blank at other combinations too but there must be more. I’ll have to think some more ha…thanks for commenting! Pingback: The Letter H is for Haterade – #DoubleFML FatDarrellPalooza! Pingback: Spoon Me! – #DoubleFML FatDarrellPalooza! Pingback: The Randy Pineapple 😉 – #DoubleFML FatDarrellPalooza! Pingback: Meme-Dependence Day! – #DoubleFML FatDarrellPalooza! Pingback: The Quest for Pizza – #DoubleFML FatDarrellPalooza! Pingback: The Real World – Super Bowl 53 Edition – #DoubleFML FatDarrellPalooza!